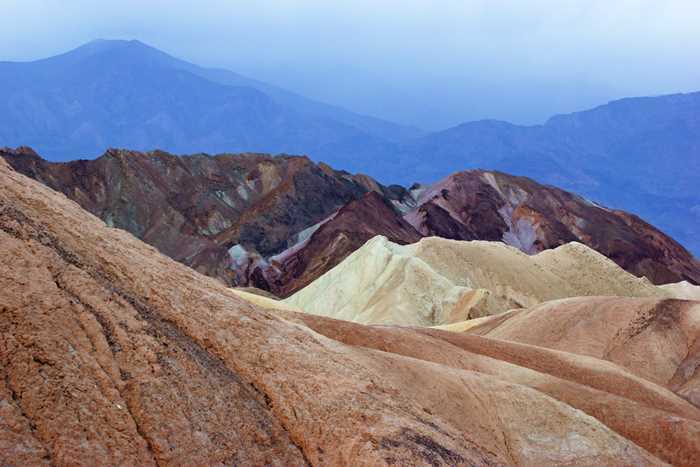 Zabriskie Point is an exceptionally beautiful part of Death Valley National Park, so it’s good that there’s more to do here than just walk out to the viewpoint. There’s also a great little trail that begins here — it’s short and easy enough for most park visitors, and you can easily expand it into a much longer hike, if you want. 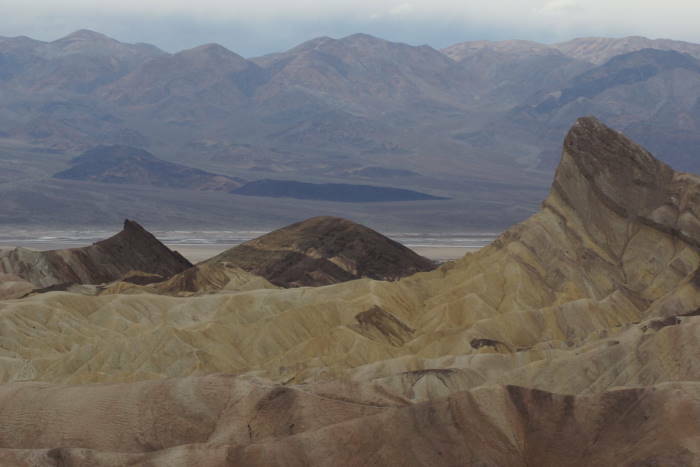 Zabriskie Point is located along California Highway 190, near the east side of the park, as you climb the hill and leave the valley. It’s well-marked, with a large parking area. 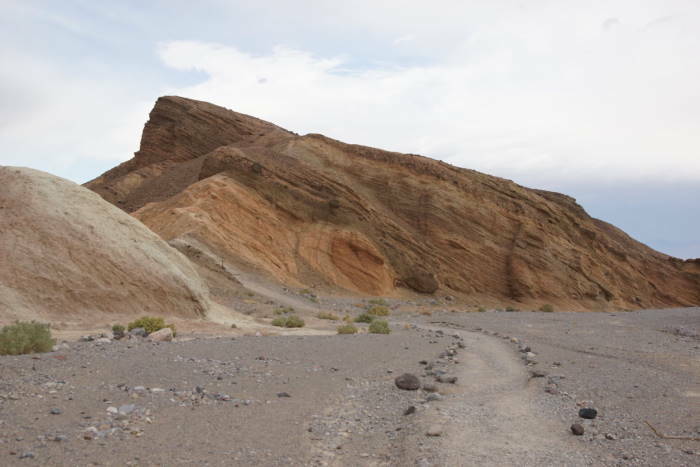 You can access the Badlands Loop trail from here, or you can include it as part of the Golden Canyon/Gower Gulch Loop, which has a trailhead along Badwater Road. 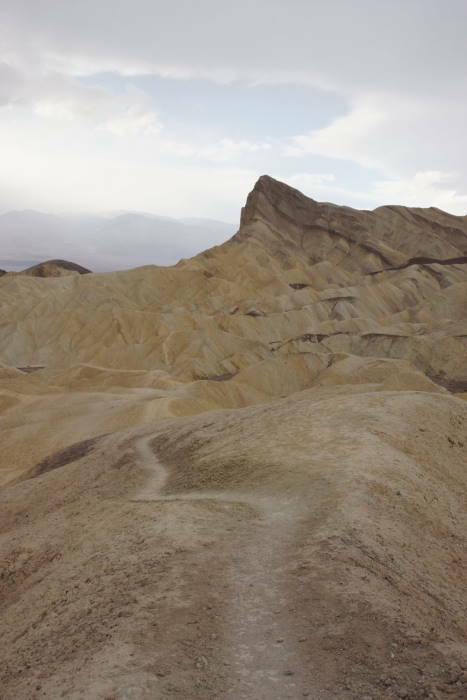 Zabriskie Point is a busy place, and it’s understandable why. A very short walk from the parking area leads up to a viewpoint of the valley. Here, you can see the backside of Manly Beacon, a very prominent peak along the eastern side of the valley. 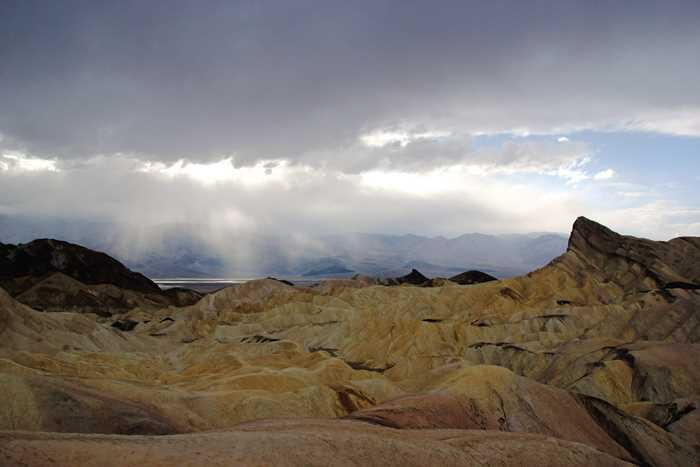 Badlands surround Zabriskie Point, and they area beautiful. Okay, so I looked around and saw the view. What next? 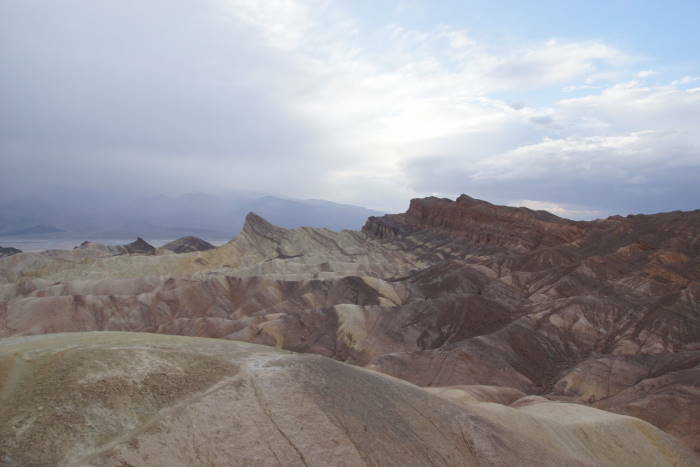 Zabriskie Point is also the starting point for the Badlands Loop. This is the start of the trail, right at the parking area. 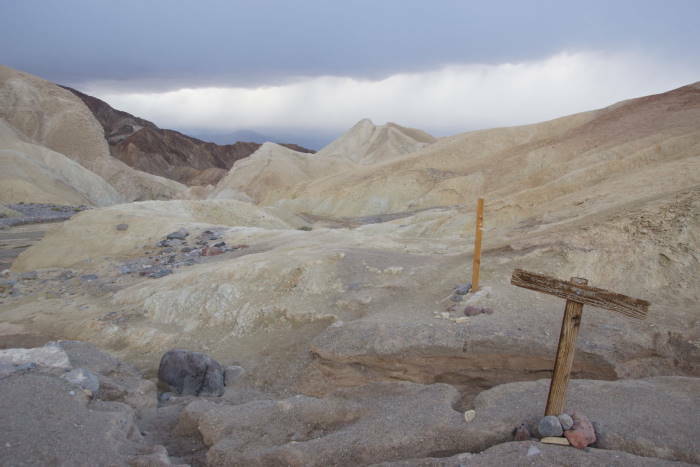 The Badlands Loop is just slightly over two miles, when you start at Zabriskie Point. It’s a “lollipop” trail – meaning you start and end on the same trail, with a loop in the middle. Part of that loop intersects the Golden Canyon/Gower Gulch Loop — a much longer trail that I’ve described on a separate page. 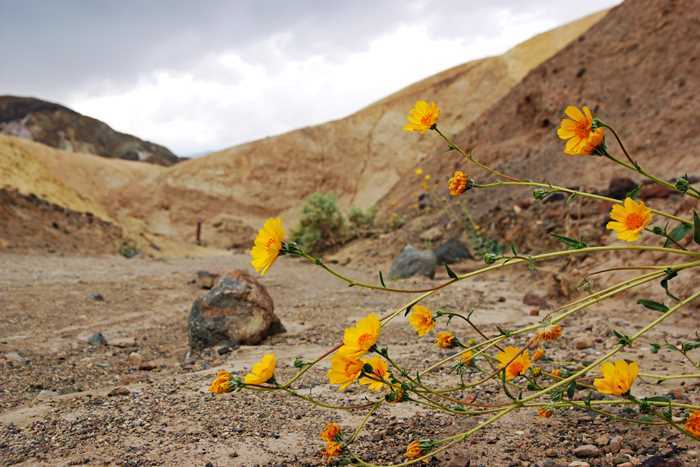 You could include the Badlands Loop as part of the Golden/Gower trail, or you could start at Zabriskie Point and hike the Badlands loop and Golden/Gower trails, all on one hike. I had decided to hike the Badlands Loop Trail at a time when I probably shouldn’t have. A storm was moving in, and the sky looked pretty threatening. But, I had skipped the Badlands Loop during my hike of the Golden Canyon/Gower Gulch Loop on the previous day, and this was my last opportunity. So, I decided to do a quick hike, hopefully beating the rain. 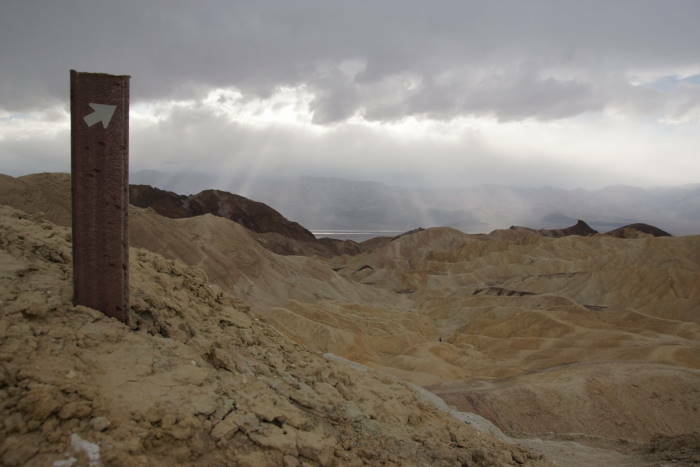 From Zabriskie Point, the trail drops down into the upper end of Gower Gulch. It’s a scenic canyon that even had some wildflowers blooming in it in early March, 2016 (a very good year for wildflowers). After 4/10 of a mile, I reached the first junction of the trail — the point where the loop begins. I chose to go right, making a counter-clockwise loop. … especially when you’re wondering what kind of weather you’re about to encounter. Is it telling me where to hike, or where to look for Jesus? You’ll see where you’re headed when you spot silhouettes on the trail up ahead. For part of the time, you’re headed towards Manly Beacon, but this is about as close as you get on the Badlands Loop. At the next junction, you could detour briefly towards Golden Canyon — in less than a half mile you’d be standing at the foot of Manly Beacon. It’s a worthwhile detour, if you don’t have time to hike the entire Golden/Gower loop. 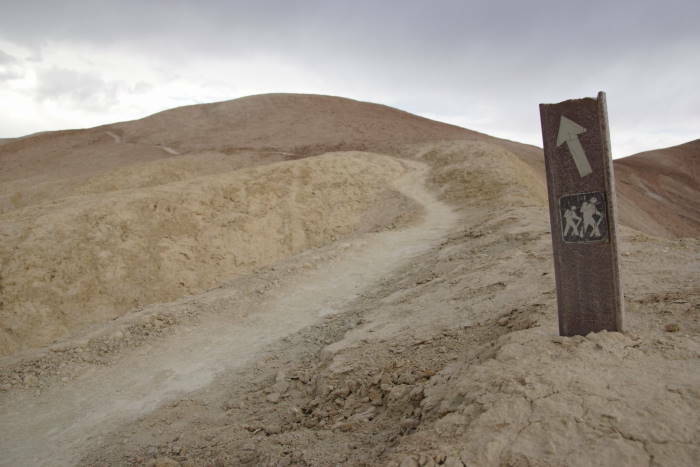 The Gower Gulch Trail and the Badlands Loop run together for 2/10 of a mile, and then the loop turns left for the return trip to Zabriskie Point. For a while, you’ll be hiking uphill at the bottom of the Gower Gulch dry wash. It’s wide and gravely, and not quite as interesting as the previous portion of the trail, when you were skirting the ridges. The trail markers are obvious, but they weren’t in great condition during my visit. No worries though, you shouldn’t have any trouble finding your way. Just keep an eye out for any signs that lead you out of the wash. It was around this time that the storm really moved in, so I put my camera away for a while. This was definitely not my favorite part of the hike — I was hiking uphill, in a light rain, and a lot of wind. I could have used a jacket, or at least another layer of clothing. So, I stopped trying to enjoy my surroundings and simply trudged up the wash, making quick work of the ascent back to Zabriskie Point. 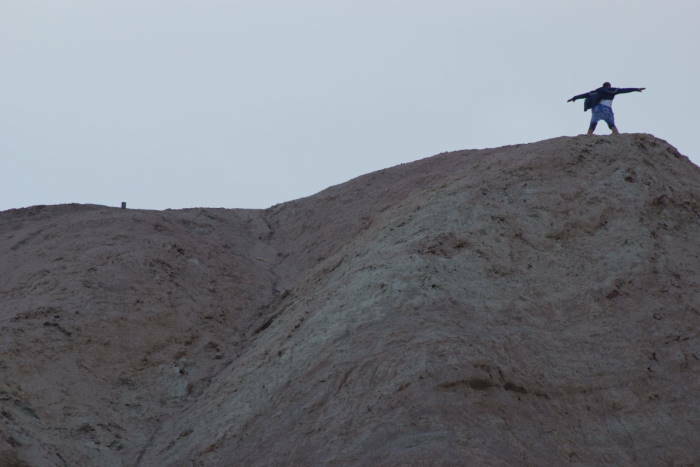 I took the camera out again when I realized I was directly below Zabriskie Point — and I saw quite a few people standing on the edge of the hill, bracing themselves against the wind, in a desert version of the Titanic “king of the world” moment. Despite the clouds and the rain, the view was quite beautiful! Admittedly, this picture is slightly Photoshopped, but it’s closer to reality than you’d probably think. Near the end of the trail, I took one last look to the north, looking towards Manly Beacon and the rest of Death Valley. 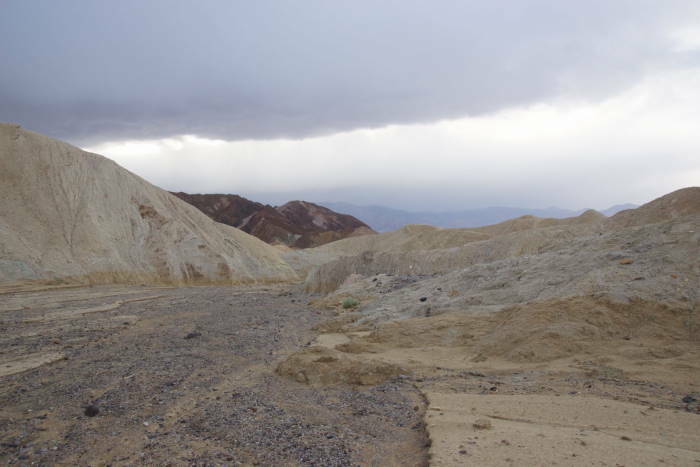 More stormy weather awaited as I made the drive back to Beatty, for my final night outside Death Valley. 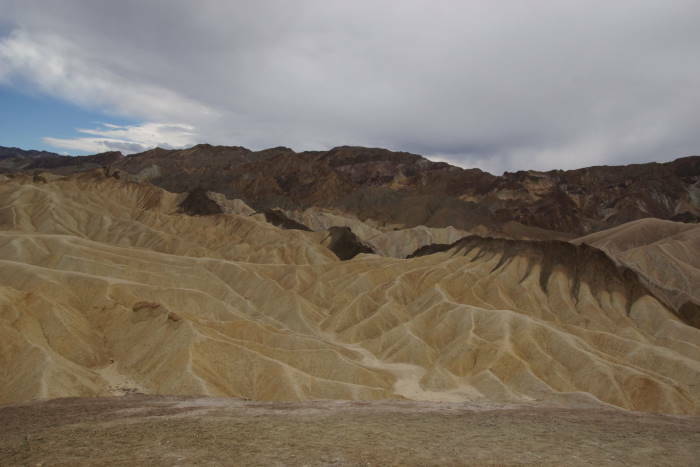 Whether your visit to Death Valley is very short or several days long, you’ll want to stop at Zabriskie Point and enjoy the view at least once. 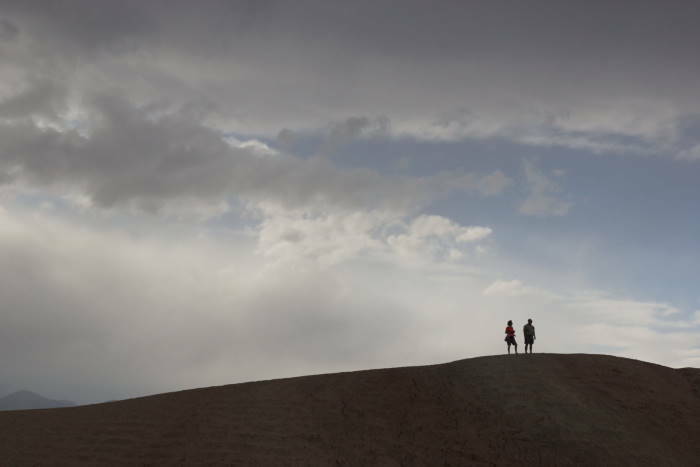 If you do have the time for any kind of hiking, the Badlands Loop Trail is a great, convenient option. You can knock this hike out in about 90 minutes or less, and you’ll enjoy some great scenery along the way. Make it longer with a detour out to Manly Beacon, or make it a half-day hike by including all of the Golden/Gower loop. No matter how you choose to enjoy it, you’ll love this part of the park. Great little walk – and maybe track markers have been improved as the trail was easy to follow. Stunning rock formations and views from the Badlands Loop, and pretty easy walking! Well worth spending an hour and doing this loop!